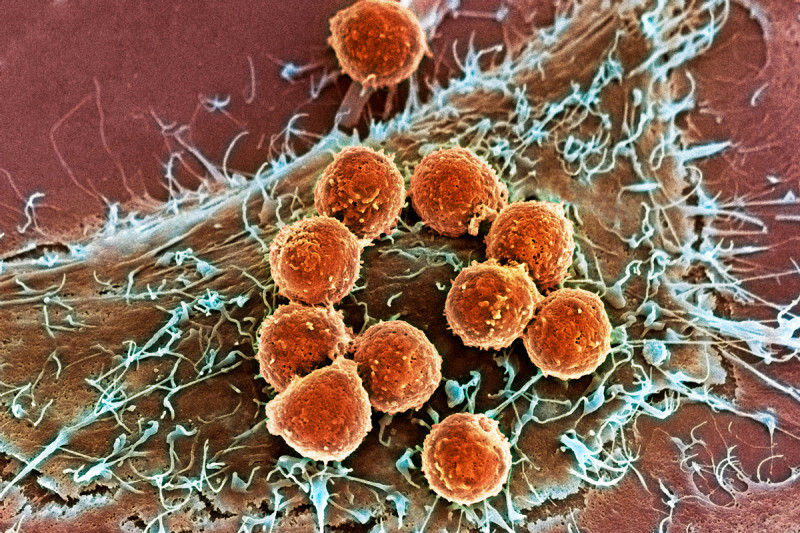 This image, captured by a scanning electron microscope, shows T cells (orange) attached to a tumor cell. Innovative treatments pioneered by Memorial Sloan Kettering researchers harness the ability of T cells to recognize and destroy cancer cells. Memorial Sloan Kettering researchers have played a major role in cancer immunotherapy research, named “Breakthrough of the Year” by Science magazine. Each year, Science magazine announces one pivotal scientific achievement as the “Breakthrough of the Year.” Memorial Sloan Kettering researchers have played a leading role in pioneering this year’s winner: cancer immunotherapy. “Immunotherapy marks an entirely different way of treating cancer — by targeting the immune system, not the tumor itself,” Science said in choosing this burgeoning field. Based on the idea that the immune system can be trained to attack tumors in the same way that it targets infectious agents, cancer immunotherapy exploits the ability to harness different types of immune cells circulating in the body. Although cancer immunotherapy is being touted as a recent breakthrough in cancer treatment, its origins at Memorial Sloan Kettering go back more than a century. In the 1890s, William Coley, a surgeon at New York Cancer Hospital (the predecessor to Memorial Sloan Kettering) discovered cancer patients who suffered from infections after surgery often fared better than those who did not. His finding led to the development of Coley’s toxins, a cocktail of inactive bacteria injected into tumors that occasionally resulted in complete remission. But eventually the use of this treatment fell out of favor. In the 1960s, research by Memorial Sloan Kettering investigator Lloyd Old led to the discovery of antibody receptors on the surface of cancer cells, which enabled the development of the first cancer vaccines and led to the understanding of how certain white blood cells, known as T cells or T lymphocytes, can be trained to recognize cancer. Anti-CTLA-4 eventually became ipilimumab (YervoyTM), a drug approved in 2011 for the treatment of metastatic melanoma, the most deadly form of skin cancer. Dr. Allison, together with Memorial Sloan Kettering physician-scientist Jedd Wolchok, helped guide the development of ipilimumab from the first laboratory studies through the late-stage clinical trials that led to the drug’s approval. Dr. Wolchok’s research on immune therapies for melanoma continues, including a study earlier this year that found that more than half of patients with advanced skin melanoma experienced tumor shrinkage of more than 80 percent when given the combination of ipilimumab and the antibody drug nivolumab, another promising immunotherapy drug under investigation, suggesting that these two drugs may work better together than on their own. The other major area of research highlighted in the Science story is the development of chimeric antigen receptor (CAR) therapy, based on the idea that a patient’s own immune cell type, called T cells, can be collected from blood, engineered to recognize cancer cells and acquire stronger antitumor properties, and reinfused to circulate through the bloodstream and attack those cancerous cells. Memorial Sloan Kettering has been a leading center in developing this technology. The first successes in this field have come in the treatment of leukemia. In March, Memorial Sloan Kettering investigators reported that genetically modified T cells had been successful in rapidly inducing complete remissions in patients with relapsed B cell acute lymphoblastic leukemia (ALL), an aggressive form of blood cancer. “This is a very exciting finding for patients with B cell ALL, directly borne out of our basic research on CARs for over a decade, and a landmark proof of concept in the field of targeted immunotherapy,” says Michel Sadelain, Director of Memorial Sloan Kettering’s Center for Cell Engineering, who led the study, along with medical oncologist Renier Brentjens. Memorial Sloan Kettering continues to study this approach and now has clinical trials under way investigating it in other types of leukemia, lymphoma, and prostate cancer, with several more trials slated to begin soon. Today, investigators in Memorial Sloan Kettering’s Immunology Program in the Sloan Kettering Institute are conducting a diverse range of studies aimed at developing the next generation of immune-based cancer treatments. For example, Immunology Program Chair Alexander Rudensky is focused on studying a subset of T lymphocytes called regulatory T cells, which are critical for keeping other white blood cells in check and therefore play an important role in controlling immune system reactions. Understanding how these cells function, and how to inhibit them will offer novel and effective ways to treat cancer. The research also has implications for treating conditions characterized by an overactive immune system — including autoimmune disorders such as rheumatoid arthritis, psoriasis, and diabetes. Learn more about immunity science at Memorial Sloan Kettering. Im a 55 yr old female, with squamous cell colorectal cancer which has gone to my live and lungs. i am currently beginning radiation on liver, could this T-cell CTLA-4 help my type of cancer? and what about the chimeric antigen receptor therapy (CAR)? Dear Rhonda, we are unable to answer personal medical questions on the blog. However, if you would like to make an appointment with one of our specialists to discuss which immune therapies may be appropriate for your type of cancer, please call our Physician Referral Service at 800-525-2225. Thank you for your comment. I am a 55 year old female who was diagnosed with Stage 3 colorectal cancer in 2012. I underwent a Duke's resection in August 2012. I took Xeloda for 6 months completing the round in March of 2013. In October 2013 I complained of pain in my right side and my CT scan revealed nothing. At the end of November 2013 my CT Pet revealed a liasion on my liver. This December I underwent a liver resection to remove th eliason and want to know if I am a candidate for CAR? Dear Donna, we are unable to answer personal medical questions on the blog. However, if you would like to make an appointment with one of our specialists to discuss which immune therapies may be appropriate for your type of cancer, please call our Physician Referral Service at 800-525-2225. Thank you for your comment. Dr. Wolchok is a genius!! Started with him in January of 2013 dealing with Melanoma. I received immunotherapy druga that shrunk my tumors to almost nothing before killing 1 and having the ither surgically removed. If you are diagnosed...get in an see Dr. Wolchok!!! THANKS DR. W!!! Is there a role of CAR treatment for glioblastoma? If there is, do you have any at SLOAN KETTERING? You also can call the National Cancer Institute’s Cancer Information Service at 800-4CANCER (800-422-6237). Is there any ongoing research to determine whether NK killer cells may also be trained to recognize and destroy cancer cells? Robert, we have forwarded your question to one of our experts in this area and will post a response when we receive it. Thank you for your comment. For the targeted immunotherapy CAR, I note your use in solid tumor therapy (prostate cancer). Do you think it is more suited for hematogenous based disease ? What data do you have in your prostate trial to date? Are you or have you done any work with immunotherapy related to dendritic cells? And if so have you seen any success? In reply to Are you or have you done any by Lisa R.
Yes we have completed one clinical trial (IRB 98-098 - melanoma), have another ongoing (IRB 10-229 - melanoma), and are opening one shortly (IRB 13-009 – multiple myeloma after autologous stem cell transplantation). A recent informative review was published by colleagues from another institution: Palucka and Banchereau, Nature Reviews Cancer, 2012; Vol 12, pp 265-277. Our trial conducted under IRB protocol # 98-098 is the next to last trial cited in Table 1 of this review, and this was separately published as Romano et al., Clin Cancer Res 2011; vol 17:1984-1997. I have a 90% probability that 2 small nodules growing in my right lung are metastasis from endometrial cancer treated with chemo and radiation 4 1/2 years ago. Too small to biopsy now. Do you think immunotherapy a possibility in dealing with this. Georgia, unfortunately we are unable to answer specific medical questions on our blog. If you would like to make an appointment with a Memorial Sloan-Kettering physician, please call our Physician Referral Service at 800-525-2225 or go to http://www.mskcc.org/cancer-care/appointment. Thanks for your comment. Have you done or are you doing any work with immunotherapy related to soft tissue sarcoma? If so, have you seen any success? has this type of treatment been explored to fight / kill Carcenoma, lung cancer and or brain cancer from the lungs? Are there any trials, treatments, studies to open, are open or projected anytime soon anywhere in the country, world? I know of someone 44 YOA with Stage 4 who is willing to try this. Robert, we already have several trials under way that use this technology, for a variety of cancer types, and more expected to begin this year. If the person you know would like to learn more about participating in a clinical trial at Memorial Sloan-Kettering, he or she can call 800-525-2225 or go to http://www.mskcc.org/cancer-care/appointment for more information. Thank you for your comment. Stage IV Cancer PNK mutation with tumor also in tailbone. Brain radiation is suggested as a preventative measure. Are there clinical trials for this? Anita, if you’d like to learn about clinical trials going on for lung cancer at Memorial Sloan-Kettering, you can call our Physician Referral Service at 800-525-2225. Thank you for your comment. Are you doing any studies with T-cells for pancreatic cancer. In reply to Are you doing any studies by Esther Megerman, Ph.D.
Esther, we asked Dr. Sadelain about this and he said there are no T cell studies currently planned for pancreatic cancer at Memorial Sloan-Kettering but there are studies planned at the University of Pennsylvania and also the Fred Hutchinson Cancer Research Center. Thank you for your comment. a year. I wonder if any studies are being done to shrink the pancreatic tumor. I've undergone an operation but the tumor was too close to vital blood vessels to enable the surgeon to cut it out. Since then it's been two month of radiation plus chemo and then four months of just chemo. I would like to be a candidate for any trials involving pancreatic cancer. Twelve years ago my right kidney was removed due to renal cell cancer. Two months ago it showed up in my left kidney and pancreas. Are there any trials for this type of reoccurances with the immunotherapy? Diane, we do not have any trials currently planned to investigate the modified T cell approach in kidney cancer, but we have many other trials for kidney cancer that are ongoing. You can find a list here: http://www.mskcc.org/cancer-care/clinical-trials/clinical-trial?keys=ki… To learn about participating in a clinical trial at Memorial Sloan-Kettering, you can call our Physician Referral Service at 800-525-2225. Thank you for your comment. I am a 66 year old female recently diagnosed with invasive lobular carcinoma, which has been found positive in several spots on my bones. I have started taking a hormone blocker, Anastrozole, and will be starting monthly Xgeva injections. Has immunotherapy been used/will be used for this type of cancer? Thank you. Rona, we do not have any trials currently planned to investigate the modified T cell approach for invasive lobular carcinoma but we have many trials for breast cancer that are ongoing, including some that may include other types of immune therapy. To learn about participating in a clinical trial at Memorial Sloan-Kettering, you can call our Physician Referral Service at 800-525-2225. Thank you for your comment. Can T Cell CTLA 4 be used to treat stage one reoccurance of uterine/endometrial cancer? Sally, we do not have any trials currently planned to investigate the modified T cell approach in endometrial cancer, but we have many other trials for endometrial cancer that are ongoing. You can find a list here: http://www.mskcc.org/cancer-care/clinical-trials/clinical-trial?keys=en… To learn about participating in a clinical trial at Memorial Sloan-Kettering, you can call our Physician Referral Service at 800-525-2225. Thank you for your comment. I have been battling Epithelioid Sarcoma since 2006. I have had over 75 lymph nodes removed in surgeries over the years. I have had 2 cycles of radiation, MAID without the D, and a chemo cocktail from Norway. I have had 3 cycles of radiation. Are their any trials that you are conducting that I may be a good candidate for. I had a CT scan yesterday and mentioned to my oncologist that I saw this article and he was open to listening. Tom, Memorial Sloan-Kettering does have some trials for sarcoma that involve immune therapy, as well as many other trials for various sarcomas. If you would like to speak to someone about which trials may be right for you, you can call our Physician Referral Service at 800-525-2225 during regular business hours or go to http://www.mskcc.org/cancer-care/appointment for more information. Thank you for your comment. My son, David, age 24 was diagnosed with an inoperable Stage III Glio Blastoma in December 2012. Treatment regimen to date: (1) radiation (28 treatments) December-February 2013 (moderate tumor reduction; (2) Temodar (7 cycles) March-September 2013 (initial tumor reduction; October 2013 MRI indicated enlargement); (3) Avastin beginning December 2013 (14 day cycle; 4 cycles completed). David has left side hemiparesis due to a brain bleed in April 2013 but is otherwise in good shape. Would he be a candidate for any trials? Susan, we’re sorry to hear that your son is ill. We have several trials for glioblastoma at Memorial Sloan-Kettering. To learn about which trials might be a good match for your son, you can call 800-525-2225 or go to http://www.mskcc.org/cancer-care/appointment for more information on how to make an appointment. Thank you for your comment. Is immunotherapy being used against adenocarcinoma? Specifically, what about metastasized esophageal cancer? E J, we do have a trial evaluating immunotherapy for a variety of solid tumors, including esophageal cancer. The lead investigator is Dr. Margaret Callahan. To learn more about how you or a loved one can participate, you can call our Physician Referral Service at 800-525-2225 or go to http://www.mskcc.org/cancer-care/appointment for more information. Thank you for your comment. I had been diagnosed with mucinous adenocarcinoma in a lung biopsy last march. A fullness in the tail of the pancreas was suspect for pancreatic adenocarcenoma Special stains were CK20 positive, local positivity for CK7 and CDX2, and TTF-1 was negative, ca19-9 was 1823. 11 chemo treatments later (stopped last september) ca19-9 was down to 85. Last month it went up again to 220. Are there any trials that would fit my situation? Thank you. Armin, we are not able to answer personal medical questions on our blog. To see a list of our clinical trials for adenocarcinoma, you can go to http://www.mskcc.org/cancer-care/clinical-trials/clinical-trial?keys=ad…. To find out about participating in a clinical trial at MSK, you can call 800-525-2225. Thank you for your comment. My mother was recently diagnosed with metastatic cervical cancer that has travelled to her bones. Are there any plans for trials involving using CAR T-Cell therapy to target HPV specific antigens and/or is this being worked on for the future? Breast cancer in 2006, and doing well til this past August when the tumor markers starting going up - markers continue to go up and no scans, PET, MRI or CT Scans can find any metastatic as of today. Would you have any suggestions on something to do now to stop the markers from increasing - I feel like it is growing/spreading and I am just waiting til I can see it before I can get treatment. Much anxiety. Melissa, we are not able to answer individual medical questions on our blog. If you’d like to make an appointment with a Memorial Sloan Kettering doctor, you can call 800-525-2225 or go to http://www.mskcc.org/cancer-care/appointment for more information. Thank you for your comment. If you would like to make an appointment with one of our specialists to determine whether you are a candidate for a clinical trial here, please call our Physician Referral Service at 800-525-2225. My dad is 63 and was just diagnosed with stage 4 prostate cancer. He is beginning hormone treatments but we are looking for anything new, even if it is a trial. Is there as anything out there to help him. My mom was diagnosed a month ago with stage IV pancreatic cancer with liver metastases. Are there any immunotherapies currently available for her? The clinical trial descriptions include contact information if you would like to learn about eligibility. Thanks for your comment.